Bergman’s dramatic statement that “I have come to believe that Israel will indeed strike Iran in 2012,” is also nothing new — it simply changes the date. We heard the same thing a year ago from Jeffrey Goldberg of The Atlantic, and two years before that from uber-hawk John Bolton, who confidently predicted that the U.S. and/or Israel would strike Iran before George W. Bush left office. It is becoming almost an annual ritual. Why do these false alarms keep going off? Bergman suggests an answer with disarming honesty: “Some have argued that Israel has intentionally exaggerated its assessments to create an atmosphere of fear that would drag Europe into its extensive economic campaign against Iran…” To this, the ubiquitous “senior American official” adds that “It is unclear if the Israelis firmly believe this or are using worst-case estimates to raise greater urgency from the United States.” In other words, Israel benefits by keeping the pot near the boiling point so that no one can ignore the Iran issue, even for a moment. The only issue seriously discussed in this country is: How exactly can we do it, or can we do it at all (without causing ourselves irreparably greater harm)? Effectiveness, not legality or morality, is the only measurement. Few in our own little world (and who else matters?) question our right to do so, though obviously the right of any other state to do something similar to us or one of our allies, or to retaliate or even to threaten to retaliate, should we do so, is considered shocking and beyond all norms, beyond every red line when it comes to how nations (except us) should behave. This mindset, and the acts that have gone with it, have blown what is, at worst, a modest-sized global problem up into an existential threat, a life-and-death matter. Iran as a global monster now nearly fills what screen-space there is for foreign enemies in the present US moment. Yet, despite its enormous energy reserves, it is a shaky regional power, ruled by a faction-ridden set of fundamentalists (but not madmen), the most hardline of whom seem at the moment ascendant (in no small part due to US and Israeli policies). The country has a relatively modest military budget, and no recent history of invading other states. It has been under intense pressure of every sort for years now and the strains are showing. The kind of pressure the US and its allies have been exerting creates the basis for madness – or for terrible miscalculation followed by inevitable tragedy. And this one is a few weeks old already, but it’s still haunting my dreams: Mark Perry’ deeply disturbing expose for Foreign Policy that describes how Israel recruited members of a terrorist organization to fight their covert war against Iran. If you have any doubt about how reckless Israel has become in its determination to bring down the regime in Iran, please take the time to read this one. While many of the details of Israel’s involvement with Jundallah are now known, many others still remain a mystery — and are likely to remain so. The CIA memos of the incident have been “blue bordered,” meaning that they were circulated to senior levels of the broader U.S. intelligence community as well as senior State Department officials. This entry was posted in Iran, Israel, Terrorism, War on February 1, 2012 by Rabbi Brant Rosen. 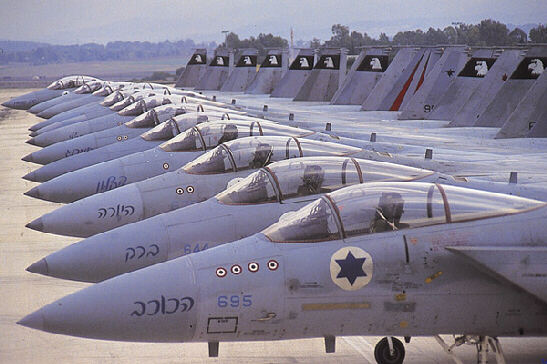 Thanks for the great pictures of the IAF F-15s. I have made it my february screen saver. Israel’s F-15s are not capable of reaching Iran and carrying the payload necessary to destroy Iran’s nuclear facilities. They could reach Iran with external ferry tanks. However, they could not at the same time carry the weapons to attack the targets. F-15s are capable of inflight refueling. They would have to do it twice to reach Iran and Israel doesn’t have the tankers to be able to pull this off. Also, they would have to use 2000 lb bunker buster bombs and this payload makes refueling in flight an extremely dangerous. F-15s were aerodynamically designed to to be refueled in air in the fighter role not in the bomber role. The ideal planes would be the B2 Spirit bomber. The B-52 or B1 bombers would work great too, however not nearly as stealthy. All 3 are high payload and long range bombers. The U.S. Air Force has them. Maybe Israel should have a couple of these as well?